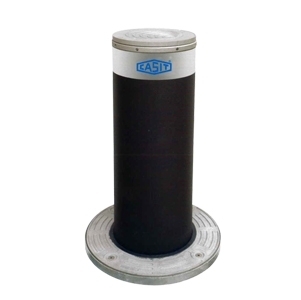 Retractable armoured hydraulic bollard, thickness 12 mm, hot galvanized. Coated Inox powder painting colour anthracite, support flange head reinforced, reflective band and aluminium head with LED walkable for pedestrians. Ciclo servizio salita-pausa-discesa 6,5 - 30 - 6 sec. Discesa in mancanza corrente / 18? C 6 sec.